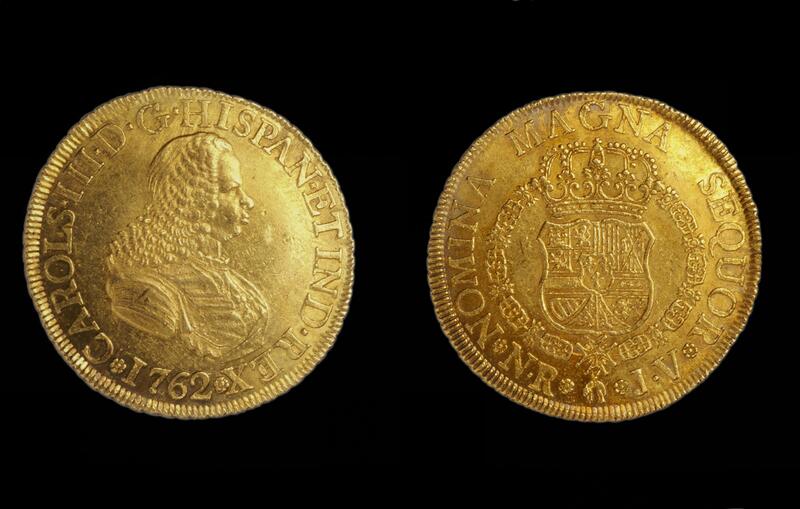 This gold coin, produced in Bogotá, features the image of the Spanish king on one side, and the royal coat of arms on the other. This photograph shows the obverse (at left) and reverse of a single coin. In the 18th century, Bourbon kings introduced the use of the king’s image on their coinage. Earlier coins, like those found in Vistas, showed royal shields. This coin bears the name of the Spanish king Charles III who ascended the throne in 1759, but the likeness is that of his predecessor, Ferdinand IV. While coin designers in the New World could quickly change the name of the king stamped on the coin, it took longer to incorporate a profile image, received from Spain. The regular edge of the coin is the result of being machine milled. The distinct border (also a feature of modern coins) prevented the coin from being clipped or shaved without detection. 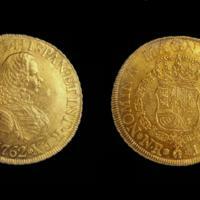 The coin is made of highly pure gold, mined in Colombia and minted in Bogotá. Spanish currency—especially silver—was used worldwide. This big (it measures 1 ½ inches or 3.8 cm across), valuable coin was called a “Spanish doubloon” by English colonists. Jordan, Louis. The Coins of Colonial and Early America.” A Project of the Robert H. Gore, Jr. Numismatic Endowment. University of Notre Dame, Department of Special Collections.